Metro boardmember John Fasana speaking at this morning's Union Station Metro Bike Hub opening. 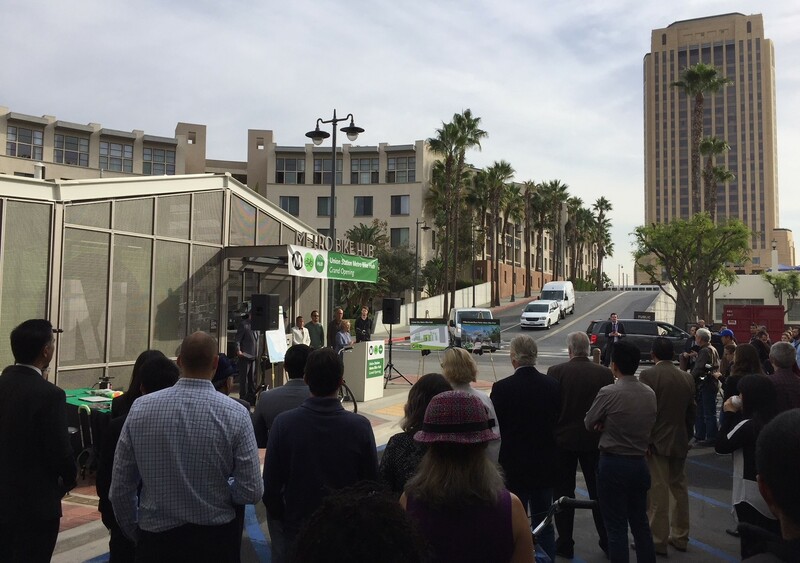 All photos: Joe Linton/Streetsblog L.A.
At Union Station this morning, Metro officials celebrated the opening of the agency’s newest bike hub. 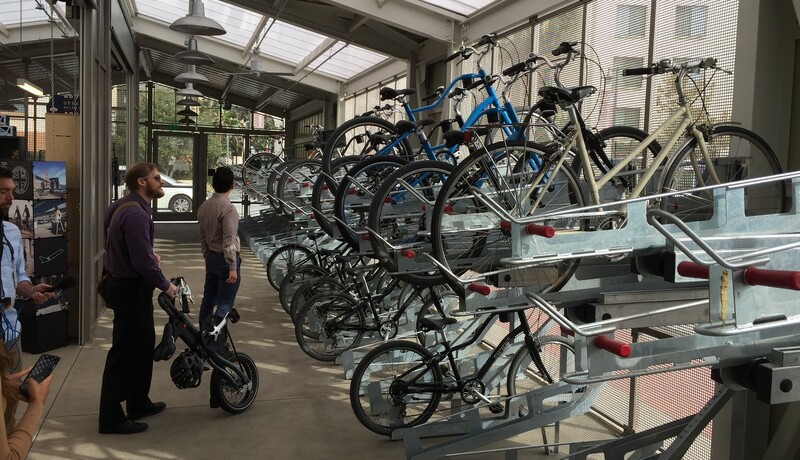 Similar to facilities in El Monte and Hollywood, the Union Station Metro Bike Hub features secure indoor bike parking and a small bike shop offering repairs and gear. 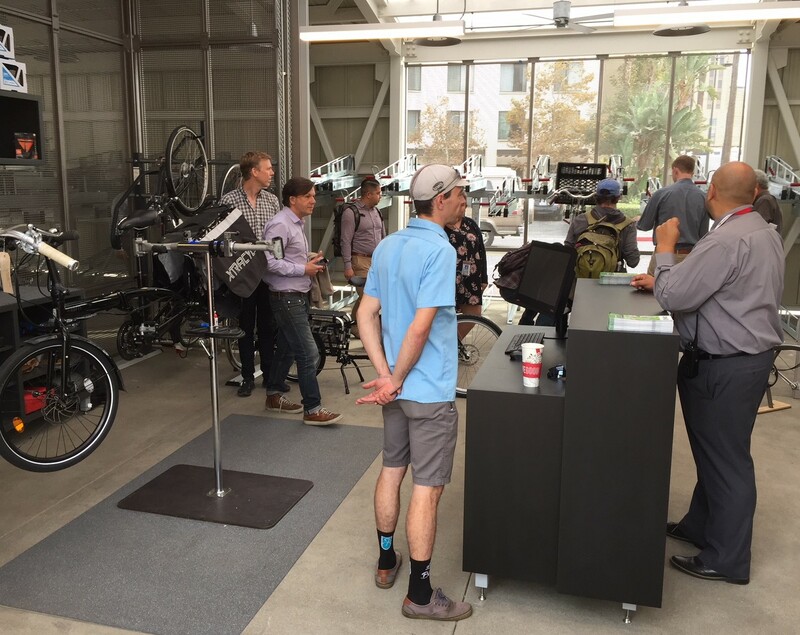 In addition, the Union Station hub offers bike rental and will host workshops and bike tours. Bike-share docks are located nearby along Alameda Street at Los Angeles Street. The hub is located just north (left) of Union Station’s historic front entrance, adjacent to the Mosaic apartments. The Union Station hub is the biggest of Metro’s three current hubs, with space to park nearly 200 bikes. Parking is available via a paid membership which costs $5 weekly, $12 monthly, or $60 annually. The Union Station hub is staffed from 8 a.m. to 6 p.m. weekdays, and 10 a.m. to 6 p.m. on weekends. Registered users can access bike parking 24/7. To register use the BikeHub website, call (888)659-2291, or visit the hub during staffed hours. 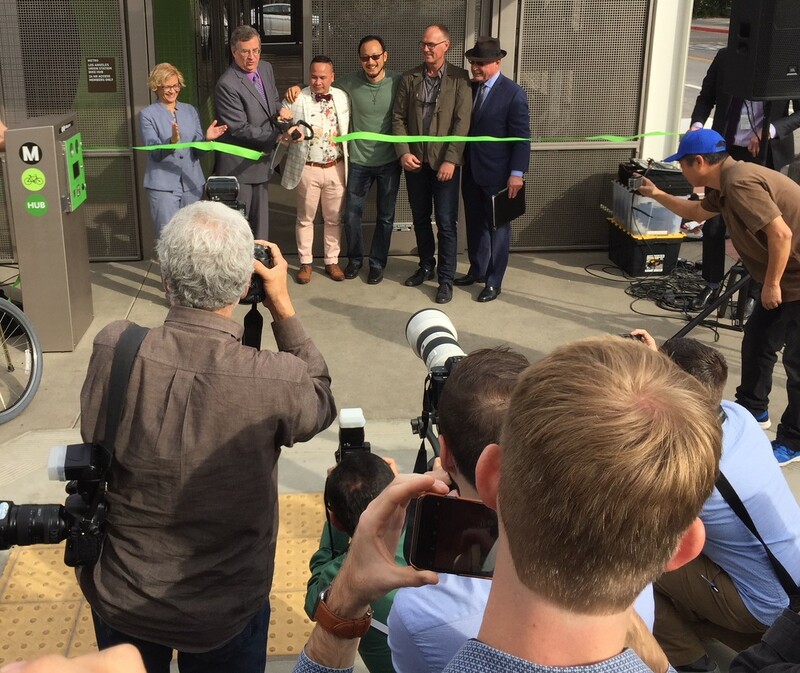 Cutting the Union Station Metro Bike Hub ribbon are: Therese MacMillan, Executive Officer of Metro Countywide Planning, John Fasana, Metro board, Gene Oh, President of BikeHub, Ron Durgin, Managing Partner of The Bike Center, and Ken Pratt, Deputy Executive Officer of Metro Real Estate for Union Station.